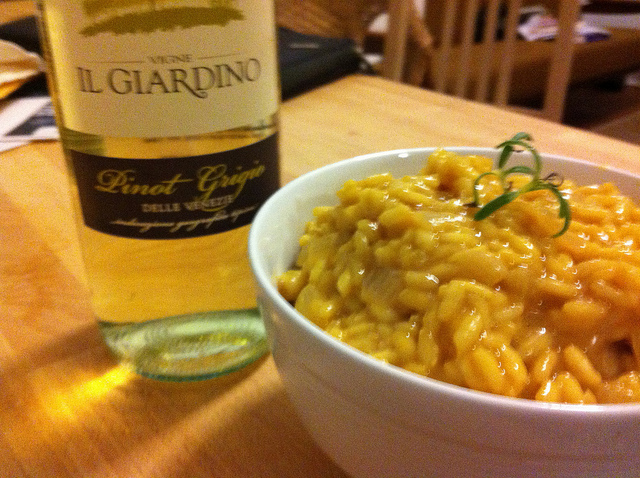 Risotto is my favorite winter comfort food, great for a quiet night at home with a glass of wine. I love this recipe because of its distinct yet simple flavors—the sharp taste of the pecorino cheese nicely balances the subtle sea-flavor of the saffron—tastes to certainly satisfy any umami cravings. This recipe exemplifies Italian cooking at its finest, letting the ingredients speak for themselves with minimal preparation. This risotto would make a great accompianment to a fish dish, or on its own with some Italian bread. Crush the saffron threads in a small bowl. In a medium pot, add the saffron threads and the chicken broth. Over medium heat, cook until simmering, and then remove from heat. Pour the mixture into a bowl on the side. In the bottom of the pot, melt 2 tablespoons of the butter. Cook the garlic and onion over medium heat, stirring occasionally, until soft, about 4 minutes. Stir in the rice until coated with butter. Add wine. Stir until the wine is absorbed. Using a ladle or a large spoon, pour one spoonful of the chicken broth in, stirring constantly. Once the spoonful is absorbed, pour in another spoonful until all of the chicken broth is used, about 40 minutes. If the risotto is still hard, continue adding more chicken broth until the risotto is soft. Remove from heat. Add the remaining tablespoon of butter and pecorino cheese. Stir until melted. Season with salt and pepper.